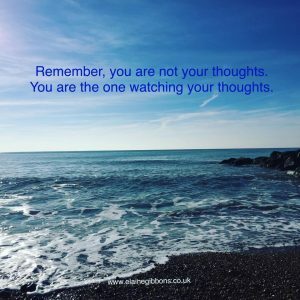 Remember, you are not your thoughts – you are the one that watches and observes them. All too often, we believe the transient thoughts that are passing through our mind. If you don’t exercise discipline and self-control over which thoughts to believe, you can end up believing thoughts that are unkind to yourself, that don’t serve you and don’t create the type of future you wish to live. Our minds have endless chatter passing through them, commonly known as the monkey mind. Allow these thoughts to pass through. Give energy to the ones that you wish to be true, that will create the future you want, that honour you and others with compassion and kindness. Your thoughts and beliefs are creating your future. Meditation and mindfulness are invaluable tools for allowing yourself to observe your thoughts. When you sit and focus on your breath, it is inevitable that your mind will start wandering. As soon as you notice this, you bring your attention and awareness back to your breath. This is the basic premise of meditation. If you have never practised meditation before, just do this for a few minutes and build it up to 10 minutes and 30 minutes etc per day if possible. By doing this short exercise, you will quickly notice how many thoughts pass through your mind all the time. Only give energy and attention to the ones that you wish to develop. A fantastic book that talks about this is The Power of Now by Eckhart Tolle. If you havent come across this book, I would highly recommend it. It can take a while to read it though as there is a lot to absorb. Enjoy!